As ferocious a fighter as he is an eater, Gruntos is loyal to Vorin and Merk, and will defend his comrades as enthusiastically as he defends his plate. He has always wanted to fight an orca, and still hopes to some day. Gruntos, the walrus, was the first Beast to tire of battle, but he wasn't any kind of a leader, so he had to wait for Vorin to come along if they were going to convince anyone else to give up the fight. Considering this toy is built around the standard Minimate body, Gruntos is huge! He's 2¾" tall, and the only standard parts that are visible are the upper arms and the thighs. He has huge armored boots and gloves, a separate loincloth and upper body (so his waist still turns), and a new head. His chestcap has armor over his massive belly, layered plates on his shoulders, and a collar around his neck. His exposed areas have a slight furry texture, and there appears to be some sort of ritual scarring on his chest. As Rustin discovered, you can remove Gruntos' chest cap to reveal a normal Minimate chest with painted costume details, but why would you? It looks ridiculous. Gruntos is armed with a big war hammer, and a double-bladed axe. They can plug into his back when he's not wielding them. Tate is the younger brother to defense department linguist Bliss Reynolds, and was attending high school when the Beasts invaded earth. He now fights by her side to keep the Praxis of Hope out of the wrong hands. If you're wondering what the Praxis of Hope is, check out the review of Tate's sister, Bliss. That has all your information. 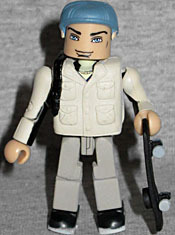 This figure is basically a repaint of movie Peter Parker, with the same coat, backpack, and even the skateboard. He has a dorky blue knit cap, but there's also hair so you can replace that. He also comes with two "non-coat" arms - black with red stripes. His coat is light beige, and his pants are khaki. His black shoes have white soles and patterns on the outsides, like fake Nike swooshes or something. 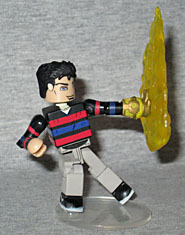 Like his sister, he includes one of the magical armored gauntlets; his is the left hand, rather than the right, and has yellow accents rather than blue. The flame shield thing is technically the same sculpt as before, but it's been molded with the "hand notch" on the other side, so it faces the other direction when it's attached, and thus looks unique. 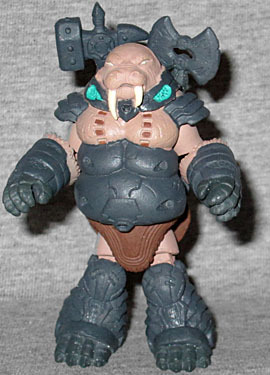 In order to make back some of the money being spent on all these new molds, the Battle Beasts had TRU-exclusive repaints, half of them representing different characters. 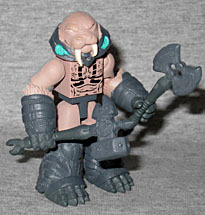 There is no TRU version of Tate, but the TRU Gruntos is a darker brown and has lighter armor.